Have you ever thought of how FLEX Loans are different from Payday Loans and ever wondered if Payday Loans or FLEX Loans fit your needs better? Payday Loans typically charge a fee and not interest and in many cases, based on state regulation, may not be prudent. With FLEX Loans, you can consolidate the debt structure within the flexible tenure. For instance, if you need an immediate cash flow for repairing your car which costs you $2,500, FLEX Loans may be the only option as many state regulations would not allow a Payday Loan for that amount. Advance Financial will provide a FLEX Loan up to $4,000 that easily covers your necessity. Unlike Payday Loans, you can pay the debt off in simple & easy payments. So, with Advance Financial’s FLEX Loan, enjoy your monetary freedom. The winner is FLEX Loans. With FLEX Loans, it is easy to get funded and paying back is worry-free. Do you need a FLEX Loan? It’s easy. 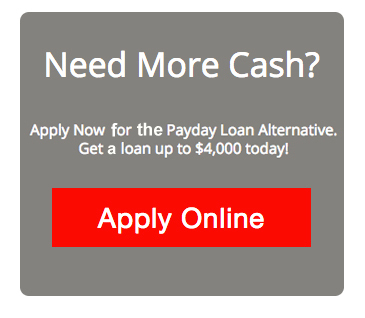 Apply now for Online Payday Loans Alternative .